Klaus Barbie was a German army captain and notorious member of the Gestapo. His life had many unexpected twists and turns but it was also an example of that Pluto getting its way in the end. Barbie was a Scorpio Sun but a very extreme example. His Sun is very close to the Ascendant which has been proven to show a person whose life is clearly focused their own ambitions. The Sun is also at the focal T Square point of an opposition between Uranus and Neptune which also includes the Ascendant and the Midheaven ( the point at the very top of the chart ). Any planet, sign and house at the apex of a Tsquare is strongly reinforced and will express itself very powerfully in the person’s life so the Sun under these conditions points to a strongly domineering individual. Barbie’s Sun is at 1 degree of Scorpio which is a fixed sign along with Taurus, Leo and Aquarius. Its very interesting that a number of leading Nazis including Hitler and Goebbels had their Sun in the first 8 degrees of fixed signs. Capricorn Research has a collection of 148 charts of Nazis, 22 of which have the Sun in these positions when the expected number would be 13. This does not mean that people born in the early part of these signs are Nazis or even prone to right wing views, in fact Aquarius is known for its unconventional political outlook. Fixed signs do, however, share a strong determination and ability to maintain their own position whatever the situation that they find themselves in. The other important point is that Pluto moved into Leo in the summer of 1938 and reached 8 degrees of that sign by the end of the 2nd World War. During this time the planet would be triggering major life changing transits to anyone with their Sun in the first 8 degrees of any fixed sign. 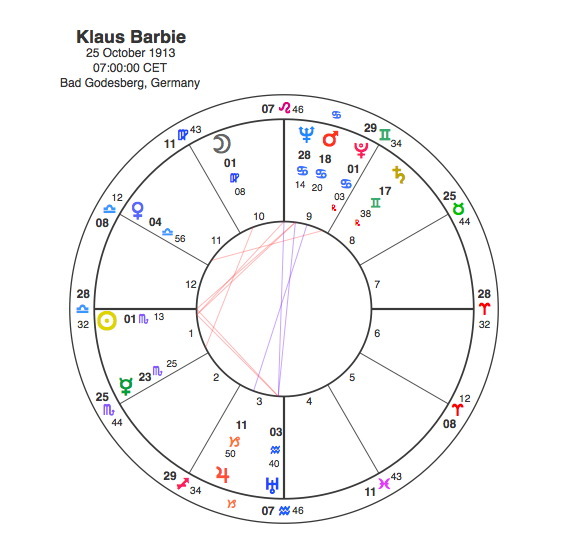 Pluto moved into Klaus Barbie’s T Square conjuncting Neptune and in square to his Asendant in 1935 at the point when he first joined the SD ( a special security branch of the SS ) at the age of 21. Pluto was actually in square to his Sun from the summer of 1938 to summer of 1941 a time which defined his rise through the ranks to army captain. In September 1942, Pluto reached a conjunction with the Midheaven which rules the pinnacle of the career and the planet remained in that place until the end of the war. In November 1942, Barbie was sent to Lyon where he personally tortured prisoners of the Gestapo. Historians estimate that Barbie was directly responsible for the deaths of up to 14,000 people and he became known as ” the Butcher of Lyon “. Most of the senior Nazi figures were either killed in the war, comitted suicide or were brought before the Nuremberg Trials and sentenced for war crimes. Incredibly Barbie escaped to South America despite the French having sentenced him to death in absentia for war crimes and there were many stories about his escape being aided by allied intelligence services. There are suggestions that he was recruited by American Counter Intelligence groups to help with their anti communist efforts. There are also suggestions that he was later involved with the capture and execution of Bolivian marxist leader, Che Guevara in 1967. Despite the French trying to get him to stand trial for many years he managed to avoid capture. The transit of Pluto to Barbie’s Sun during the war was a square aspect, extremely powerful and a definite turning point but not the fundamental watershed moment of his life, that moment would be provided 40 odd years later by Pluto’s conjunction with his Sun. Pluto conjoined Barbie’s Sun and Ascendant in 1983 – 4. In January 1983, he was arrested by the newly elected government of Bolivia and extradited to France. In 1984 he was indicted for war crimes. Pluto’s path through the TSquare for the second time in Barbie’s life ended with a square aspect to his Midheaven in July 1987 at exactly the time he was sentenced to life imprisonment in July for the crimes committed when Pluto made its earlier contact. Noone escapes a Pluto transit.